As Boston grew into an international city of culture and industry, so grew its seemingly endless thirst. The result: a reservoir that gave rise to the city while burying under water towns and history miles away. If you drive into Belchertown, Massachusetts on Route 9, you, like thousands of others, will encounter a vast body of water that upon first glance seems like a huge, natural idyllic creation from The Ice Age. The truth is less ancient but much more intriguing. For this is Quabbin Reservoir, a 1930s engineering feat that was unmatched at the time. It is one of the largest manmade public water supplies in the United States. Construction for the reservoir began in the early 1930s and ended in roughly 1939. Making the reservoir a reality began decades before when the Swift River was dammed to provide waterpower for local industry such as palm leaf hats, textiles, shoddy, and piano legs. The dam heralded a period of prosperity for the inhabitants of the valley which increased with the construction of the railroad. In the 1890s, Boston’s water supply could not keep up with demand and another source of water needed to be found or created. The Swift River Valley matched all the criteria government officials were looking for. In 1927, the Massachusetts State Legislature officially declared the valley would become the Quabbin Reservoir, the source for Boston’s unquenchable thirst. 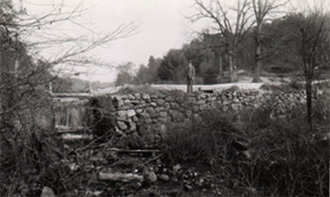 By 1933 and 1935 respectively, construction of Goodnough Dike and Winsor Dam began, which would create “The Quabbin” as it’s known locally. Before the reservoir’s construction, there was a hill in Enfield called Quabbin Hill and a lake in Greenwich called Quabbin Lake. Named for a Native American chief called Nani-Quaben, meaning place of many waters, these became the basis for naming the new reservoir. The cost of the reservoir was immeasurable, including the total annihilation of the valley. The entire population of four towns was relocated and the towns submerged. They were Dana in Worcester County, and Enfield, Greenwich, and Prescott all in Hampshire County. The land remaining from the discontinued towns was added to surrounding municipalities, including Belchertown, Pelham, New Salem, Petersham, Hardwick and Ware. According to government records, one additional town on the reservoir is Shutesbury in Franklin County. Because of New Salem's annexation of the Prescott Peninsula, a large wedge of land shifted from Hampshire County to Franklin County. Today, the majority of the reservoir lies in either New Salem or Petersham. 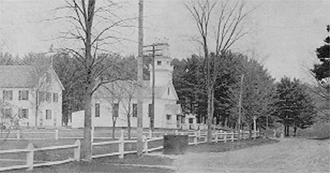 To begin construction, hundreds of homes, businesses, a state highway, a railroad line, and 34 cemeteries were moved or dismantled, and over 6,000 graves were relocated from the valley to Quabbin Park cemetery. In total, thirty-nine square miles of land was cleared, burned, and flooded - total devastation of a beautiful area of western Massachusetts. By 1939, the new reservoir began to fill, becoming one of the largest unfiltered water supplies in the world. It created a reservoir 18 miles long with 181 miles of shoreline, including 61 miles along the reservoir’s 60 islands. When full, the reservoir holds 412 billion gallons of water. Today you can learn more about the effect the reservoir’s creation had on the area and the 2,500 people displaced by watching Haunting the Quabbin: Inside Out. The documentary explores what had to be done to create water supplies for Boston in the late 1930s. The program is led by Sean Cole, who meets valley residents who were forced to move. They recall their vivid memories of their lives in the towns that were destroyed. What happened is still part of who they are and how they live. It can be viewed online here. 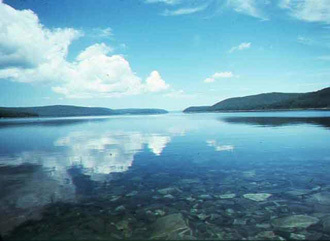 Other programs have been made about the Quabbin, including an underwater documentary by the Massachusetts state government that explores what was left behind by the inhabitants. Sadly this is not currently available. You can also take a personal tour of the reservoir, but regulations require that all egress is through designated access points. Anything that could pollute the water supply system, such as litter or refuse, is strictly prohibited as are direct water contact activities, such as swimming and wading. Dogs are not allowed on any part of the Quabbin Reservoir property. 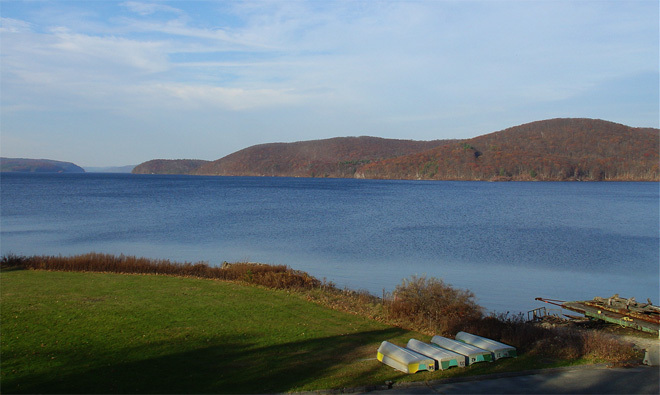 Fishing is allowed at The Quabbin which many anglers enjoy. The reservoir supports 27 species of fish, 17 of which are sought by fishermen, such as lake trout, landlocked salmon, smallmouth bass, and white perch. According to records, anglers can catch 50 - 100 of these large, white perch in a good day.